Sky King was a 30 minute action series that had started as a radio program of the same name. The storyline was about a former World War II pilot named Schuyler King. 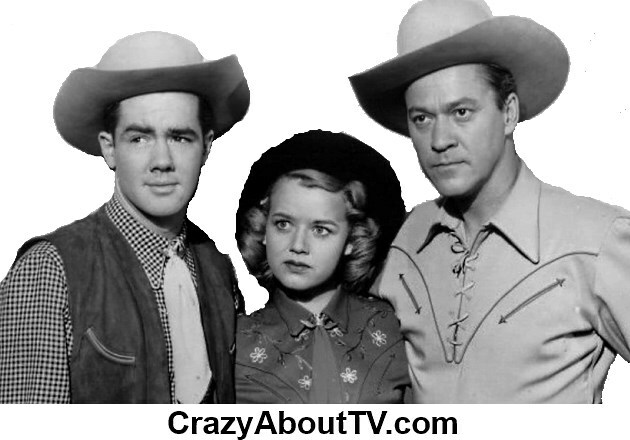 Along with his niece and nephew "Penny" and "Clipper", they lived on the Flying Crown Ranch near the ficticious town of Grover, Arizona and near a top-secret military installation. Due to his military background and the small numbers of law enforcement officers in the area, Sky King often found it necessary to round-up the local bad guys and protect the military installation from being robbed, spied upon, or blown up. "Out of the clear blue of the western sky comes Sky King!" There was also a Sky King radio show that was broadcast beginning in 1946. That series ran for eight seasons until 1954, overlapping with season one of the TV series! Sky King's airplane was called, "Songbird" and two seperate planes were actually used during the series. They were a Cessna T-50 Bobcat and then a Cessna 310B. Like many other shows of the 1950s and 1960s, Sky King often had to save his niece, nephew or some other very innocent person from the clutches of some villain. Typically the person's life was in serious danger and Sky King would show up to save them at the very moment before their impending death. Thank you for visiting our Sky King TV Show page!